On April 20, survey firm D’Strafford Inc. released a non-commissioned presidential pre-electoral survey that showed Roxas and Poe statistically tied at the top spot [Sun.Star]. Netizens were shocked, especially since the results do not match those of well-known survey firms Pulse Asia and SWS, where Roxas consistently ranked either 3rd or 4th among the five presidentiables. 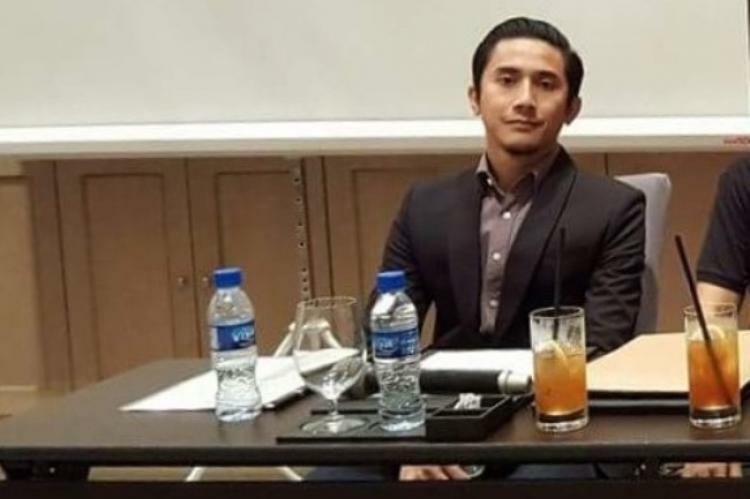 In her “RoRo and that Funny Survey”, veteran journalist and ABS-CBN columnist Inday Espina-Varona did a background check on survey firm D’Strafford Inc. Espina-Varona cited observed some weird things about the said survey company, such as a skeletal website and non-functioning company phone numbers. What's most disturbing, however, is Espina-Varona's discovery that there are no statisticians among the firm’s officers, etc. That's just like putting up a hospital with no doctors. It sounds absurd as it is, but for now, let's give D'Strafford the benefit of the doubt. Let's do a bit more sleuthing. In response to allegations of conducting a bogus survey, D’Strafford Executive Director JM Balancar said, “We welcome everyone for any questions and clarifications (regarding the survey) [Sun.Star]”. Search term is “JM Balancar –indayvarona.com”. TP added the “-indayvarona.com” to exclude pages from IndayVarona.com, as that website uses faulty timestamps, probably due to obsolete HMTL coding. Timestamps are important because TP searched for pages published before 01 April 2016, i.e. before D’Strafford sprouted from nowhere. The first entry, from SunStar, is a dud: it was a about PNoy receiving foreign diplomats. Meanwhile, all the other entries in all the seven pages have nothing to do with a “JM Balancar”. 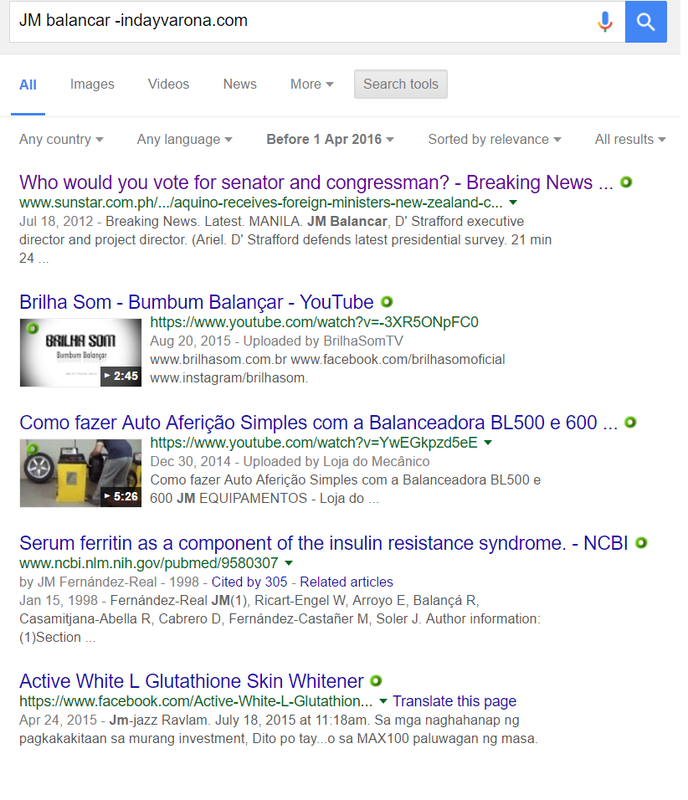 That is, there is zero mention of JM Balancar on the web before April 2016. No survey company head worth his salt has zero online presence. SunStar Manila also mentioned D'Strafford in-house consultant Ralph Fuentes, whatever that job title means. Again, no online presence. TP will not expound on this claim anymore because he feels that the Executive Director's questionable reputation is sufficient to show lack of credibility on the part of D'Strafford's staff. Was their site created on or before 03 December 2005? BRIEF: The Internet Corporation for Assigned Names and Numbers [ICANN] is a Los Angeles-based nonprofit organization that is responsible for overseeing online domain registrations. 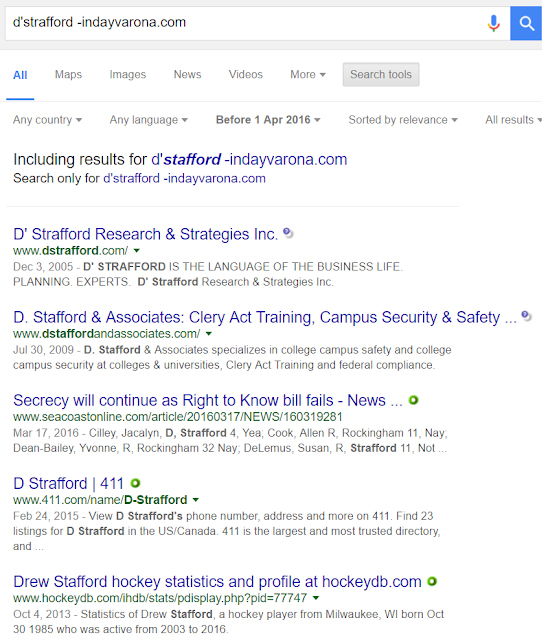 That is, Dstrafford.com’s site was first registered on 14 April 2016. Yes, just barely over two weeks ago. TP was informed that this survey firm actually has a Twitter account [@DStraffordInc] so TP decided to take a look. TP discovered that D’Strafford’s first-ever tweet was on 21 April 2016. Yes, D’Strafford has never tweeted anything else before that. But things get more interesting. As of 9:00 AM 03 May 2016, D’Strafford’s Twitter account follows only 17 people and it has only 30 followers. That already sounds fishy, but taking a closer look at the accounts they follow show an even more revealing story. 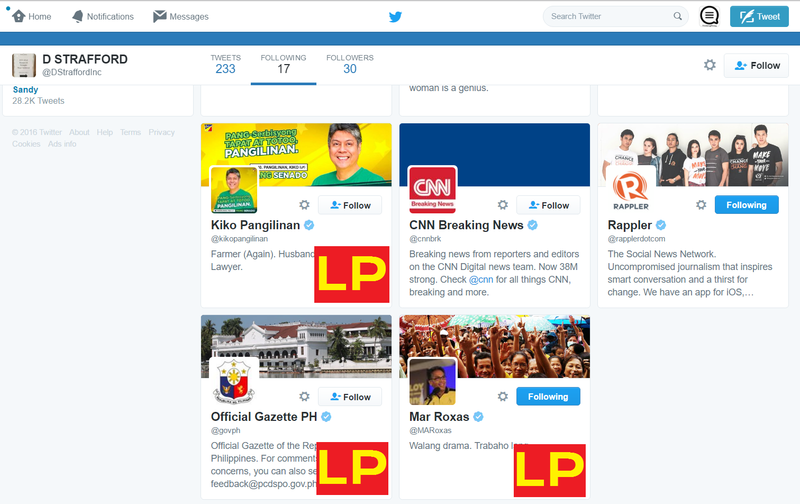 Of the 17 people they follow, 10 of them are obviously aligned with the Liberal Party, and the first account they followed was the official twitter account of LP presidential bet Mar Roxas. 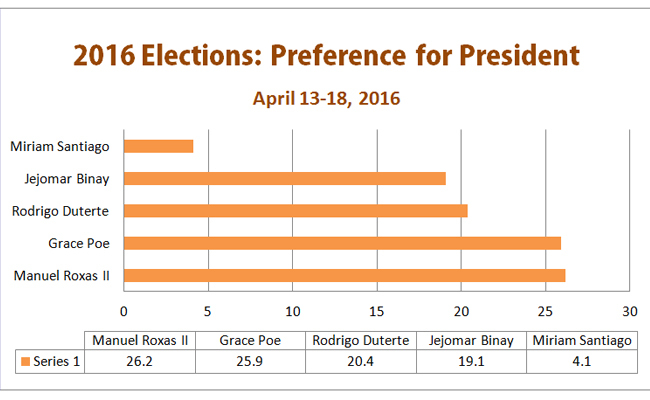 D’Strafford does not follow the accounts of presidential bets Grace Poe, Miriam Defensor-Santiago, Jejomar Binay, and Rodrigo Duterte. Shown below is the complete list of the accounts they follow. 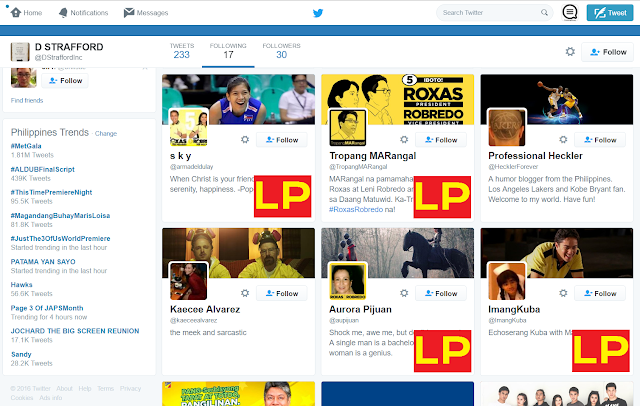 TP added labels to show which of the followed accounts are aligned with LP. 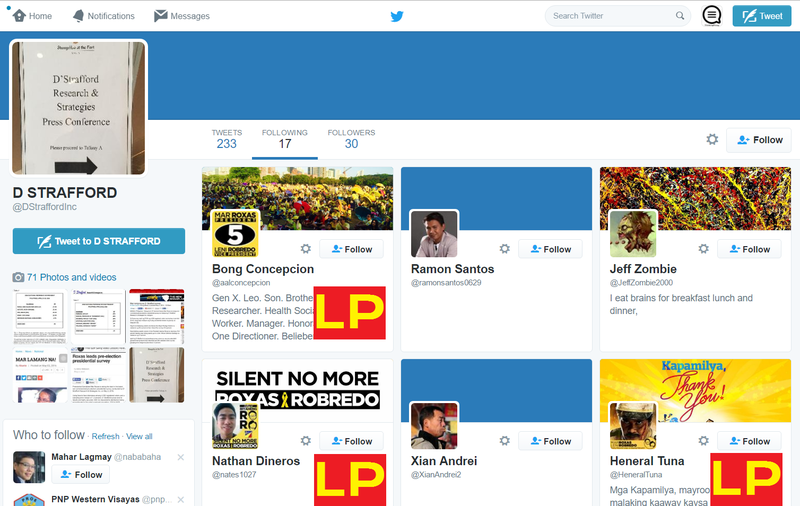 Ramon Santos, Jeff Zombie, Xian Andre appear to be D'Strafford's twitter bots, or accounts that are managed by a program that automatically retweets D'Strafford's tweets. The Professional Heckler is a political satirist, so let's just consider him neutral.The last two -- CNN and Rappler -- are news agencies, so they also count as neutral. In short, 14 of the 17 accounts that D'Strafford follows are pro-Roxas. A skeletal website, unreachable company phones and the absence of a statistician among its officers... Espina-Varona’s blog post alone was enough to convince me that D’Strafford does not only issue bogus survey results: it is a bogus company itself. There's no doubt that D'Strafford is a dubious company at best, an LP-funded firm at worst. But I guess some Roxas supporters are so desperate for good news, they believe spurious information as long it favors their candidate.